A Nigerian newspaper, the Daily Sun, is having a good laugh at the expense of the Ghanaian authorities. In its Tuesday, March 2, 2004 issue, the Daily wondered why the government of Ghana wasted vital resources in sending a delegation to Nigeria to learn about how to implement a national identification system. In an opinion column and under the headline, “Nigeria, Ghana and the ID Card Scheme,” the newspaper said it was “strange that Ghana chose Nigeria for the purpose of learning ways to implement its own scheme” in view of the country's monumental failure in the regard. The full text of the article is published below; We find it laughable that the Minister of Internal Affairs, Dr. Lyorchia Ayu chose to ingratiate a Ghanaian presidential delegation which visited him recently on the possibility of Nigeria assisting the Ghanaian government in the execution of its National Identity Card project (NICP). The Ghanaian delegation was in Nigeria to get vital information on Nigeria's implementation of its NICP. The overall aim is to learn from Nigeria as it pursues its own ID card scheme. It is somewhat strange that Ghana chose Nigeria for the purpose of learning ways to implement its own scheme. Nigeria has been on this national project since 1979 and up till now, the country is yet to find the tree for flue wood. Strictly speaking, Nigeria is still in the dark over this national scheme, and why Ghana chose to learn from Nigeria in his project despite our failings is therefore curious. This is especially so considering the fact that one of the things Ghana wants to learn from Nigeria is the technical expertise for the project. Strangely, Ayu promised Nigeria would help Ghana in this regard. We are constrained to wonder whether Nigeria has any technical expertise in the execution of he ID scheme. If we have the technical know-how, how come that this project has remained still-born since 1979? When a quasi-registration exercise was conducted early last year, our lack of preparedness for the scheme was there for all to see. The exercise was shoddy. The machines, in most cases, could not be powered owing to a number of lapses. For weeks, millions of Nigerians who meant to partake in the exercise could not do so because of the system put in place could not work. 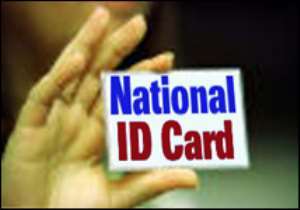 More than one year after the so-called registration exercise, the ID cards are not yet available. The entire scheme looks murky. Up till now we are yet to understand why government want about the exercise un such a rowdy and uncoordinated manner as if there would be no tomorrow without it. Given the fact that we have failed to implement our own ID card scheme successfully, Ghana may not really learn anything from Nigeria. But if there is anything to learn at all, Ghana should be striving towards making its own scheme be different from Nigeria's.